Shotaro Okano first came into contact with wireless technology in the radio club at his high school. There, he learned about the principles of crystal radios, nami-yon (four-tube regenerative receiver, and superheterodyne radios, as well as how to make them. After the Second World War, the shadow of defeat persisted for some time in the streets. Nevertheless, the eyes of young Mr. Okano shined brightly. He felt that these small boxes, capable of transmitting the voices of people from far away, might hold the key to a promising future. He devoted himself to learning everything he could, and the days passed quickly. As a result, it did not take long before he became proficient in wireless technology. He firmly believed that after graduating from university, he would work at a large company such as Tokyo Shibaura Electric K.K. (now known as Toshiba Corporation) or Kokusai Electric Co., Ltd. (now known as Hitachi Kokusai Electric Corporation), where he could immerse himself in wireless technology. However, during his senior year at university, he was called upon by his supervising mentor from their research department (Figure 1). His supervisor explained that Japan had an urgent need to build its telephone business industry, and strongly encouraged him to join Toyo Communication Equipment Company in order to demonstrate the full extent of his abilities in this field. Although Mr. Okano knew very little about this company, he was enticed by the mention of ‘communication equipment’ in the company's name, which hinted at the prospect of being able to work with wireless technology. He felt momentarily inspired, until the next instant, when his supervisor made another unexpected request: "I want you to join Toyo Communication Equipment Company and learn about quartz devices." Photographed with his supervising mentor and colleagues in their research department. Mr. Okano was confused. He had wanted to work with wireless technology, but was now being instructed to work with quartz devices. Although he had attended lectures at his university conducted by Tokyo University Professor Noboru Takagi, the authority on quartz device research, he knew almost nothing about quartz. Nevertheless, he felt that he was unable to outright refuse this request from his supervisor. Reluctantly, he accepted his mentor's suggestion. In April of 1954, with the cherry blossoms in full bloom, Mr. Okano unhappily began to commute to Kawasaki, where the Quartz Department of Toyo Communication Equipment Company was located. Around six months after he joined the company, he was suddenly given an opportunity to receive practical instructive education while at the communication research laboratories of Nippon Telegraph and Telephone Public Corporation (now known as ‘NTT’). His goal was to learn about technology for crystal units that adopt wire mount systems*1). In those days, crystal units that adopted this technology were indispensable compositional elements for phone systems. In other words, this work was extremely important for Toyo Communication Equipment Company. Despite being tasked with this important responsibility, Mr. Okano still could not let go of his dream of working with wireless technology. He found it hard to be motivated, and set off for Musashino City in Tokyo with mixed feelings. *1) Wire mount technology was used to hold or retain crystal units to achieve frequency contour vibration with a high Q factor (the ‘sharpness’ of a resonance curve). It was developed in around 1952 at the Electrical Communication Laboratory of Nippon Telegraph and Telephone Public Corporation (NTTPC, now known as Nippon Telegraph and Telephone Corporation or ‘NTT’) under the guidance of Tokyo University's Professor Noboru Takagi. It was here that he met Mr. Kiyoshi Takahara, Head of the Crystal Unit Technical Development Section. Mr. Takahara was a researcher from Tokyo University who was considered to be the nation's best in the practical development of crystal units. His thesis had been on crystal units in the 60k to 120kHz and 400k to 600kHz bands that utilized wire mount technology. These crystal units were indispensable for channel filters in telephone systems that used 4MHz coaxial cables. Telephone networks in those days were required to transfer a large volume of information at once, so there arose a demand for increased multiplicity. Accordingly, channel filters that could achieve steep characteristics were vital. This resulted in research institutions around the globe competing to develop a channel filter that incorporated crystal units*2). Although European and U.S. research institutions were in the lead, Japan was certainly not left behind. According to Mr. Takahara, there was barely any difference between quartz technology in Europe or the U.S. and Japan at that time. In fact, they were more or less equal. Therefore, if their team performed well at this task, it would allow them to shine on the global stage. Suddenly, Mr. Okano had found a reason to be motivated. Another important circumstance was that the Quartz Department at Toyo Communication Equipment Company had installed one of only 3 Hewlett Packard frequency counter devices in Japan at that time. Mr. Okano was thrilled at the thought of being able to use such cutting-edge measuring equipment everyday, and began to realize what an ideal environment he was able to work in. It dawned on him that he had the potential to perform on a global scale, and that he had the freedom to use this amazing measuring equipment however he needed. He was more than satisfied by this fact alone. Within a few short months of commuting to the Electrical Communication Laboratory, Mr. Okano found he had become completely transfixed by quartz technology. He was still interested in wireless technology, of course, but his new passion for quartz was quickly winning him over. As winter began to descend on Tokyo, he felt the darker, shorter days reflected in the moods of those around him. Yet his own mood remained buoyant, light and positive. *2: In addition to crystal units, LC filters incorporating high performance magnetic materials can be used as a technology to achieve channel filters. In Japan, ‘nephelite’ was developed at the Institute for Materials Research (IMR) at Tohoku University, and channel filters using this new material were then incorporated in telephone networks. While quartz channel filters did not become mainstream in Japan or Germany, they were adopted widely in the U.S. and U.K.
At the time Mr. Okano first made the decision to put his efforts into quartz technology, wireless communication technology was evolving at breakneck speed. As the applications of this latter technology expanded, the demand for higher frequencies increased in order to operate wireless communications. Until then, Toyo Communication Equipment Company had prided itself on its patented BT-cut crystal units. The BT cut enabled crystal units to be manufactured easily because the quartz substrate could be made thicker provided it had the same frequency. Another major advantage was the comparatively low sensitivity of the frequency thermal properties to variations in the cut angle. However, the defensive range was a low frequency band, making it difficult to produce higher frequencies. To keep up with current trends, they would need to switch to AT-cut crystal units. Although still in his twenties, it was Mr. Okano who was placed in charge of this new development, having studied the basics of crystal unit technology at NTTPC's Electrical Communication Laboratory. Development began in 1957 with a thorough investigation of AT-cut quartz substrates. These substrates had many characteristics that were appealing to Mr. Okano, and it wasn't long before he was completely charmed. The five main advantages of AT-cut quartz substrates are as follows: (1) Properties are resistant to changes in the surrounding environment, (2) thermal properties are represented by a cubic curve, (3) influences from the state of quartz substrate contours can be avoided, (4) the quartz substrate can be stably supported thanks to sections with zero amplitude and distortion, (5) properties are enhanced by the beveling process, resulting in a lower defect rate. Mr. Okano continued making progress with his investigations of AT-cut quartz substrates. One day, his boss and inventor of the BT cut, Mr. Hiroshi Yoda, returned from a business trip to the U.S., bringing with him a special souvenir from his travels. It was a 1MHz frequency standard incorporating an AT-cut quartz substrate, manufactured by U.S.-based James Knight Company (Figure 2). As he left the lab, Mr. Yoda's parting words to Mr. Okano were simply: "Study this." Figure 2 A 1MHz frequency standard from the James Knight Company. Mr. Okano based his developments on this 1MHz frequency standard. (Archival material from the Quartz Crystal Industry Association of Japan (QIAJ)). The first task assigned to Mr. Okano after he had diligently studied the U.S.-made 1MHz frequency standard was a crystal unit for use in a broadcast network. At 550k to 1605kHz, it was clear that this high frequency would demand the use of the AT cut. In those days, one of Toyo Communication Equipment Company's competitors was responsible for manufacturing crystal units for broadcast networks. These crystal units were housed in a case (frame) containing a lower electrode plate. A rectangular AT-cut quartz substrate was then placed inside the case, and this was covered by a disc-shaped electrode (Figure 3). The resulting unit was then placed in a thermostatic oven*3), which somehow secured the crystal unit's properties. However, there was a major problem with this manufacturing process. Neither the top nor the bottom surfaces of the AT-cut quartz substrate was affixed to the electrodes. The quartz substrate was simply placed loosely on top of the lower surface. As for the top surface, a gap*4) was established between the disc-shaped electrode and the quartz substrate so that signals could be transmitted via the electric field. Since neither the top nor bottom surfaces were firmly fastened, the substrate moved whenever a vibration or impact occurred, and this caused its properties to change. It was not possible to affix the substrate because the concept of oscillation regions had not yet been implemented. Additionally, the unstable, unnecessary oscillation mode for temperatures could not be removed. Accordingly, a thermostatic oven was essential for applications that demanded high precision. This required meticulous attention when undergoing maintenance, and the task was extremely difficult. This one was manufactured by Toyo Communication Equipment Company. The frequency can be adjusted by turning the knob on the upper section. (Archival material from the Quartz Crystal Industry Association of Japan (QIAJ)). *3) This mechanism maintained a constant surrounding temperature once the crystal unit was placed inside. Although thermostatic ovens are also used in scientific experiments, they are usually much larger. Quartz oscillators use a compact thermostatic oven that is just a few centimeters square. *4) By adjusting the gap, it was possible to adjust the oscillation frequency. The broadcast network was troubled by this problem. Looking for a solution, they turned to crystal units that incorporated 4MHz coaxial cables, which Toyo Communication Equipment Company had been manufacturing for telephone systems. This crystal unit had a quartz substrate that was firmly fastened to the electrode, and its glass tubes were vacuum-sealed. Its mechanical stability clearly demonstrated that maintenance would be greatly improved. The broadcast network was highly impressed. 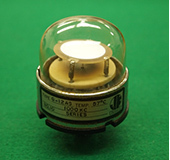 Toyo Communication Equipment Company was immediately swept with a wave of requests to develop AT-cut crystal units with vacuum-sealed glass tubes. This kind of crystal unit was virtually identical to the one that had been contained in the 1MHz frequency standard from the John Knight Company that Mr. Yoda had brought as a souvenir. Mr. Okano had investigated and memorized every last millimeter of the crystal unit from the U.S. He understood that he had been assigned a very special responsibility, and embarked upon his new development full of enthusiasm. The first AT-cut crystal unit he tried his hand at developing had a frequency of 550kHz. Based on his investigation of the 1MHz frequency standard from the James Knight Company, he decided he would adopt the same biconvex shape for the quartz substrate. The term ‘biconvex’ refers to a shape like that of a magnifying glass lens that is convex on both sides. This kind of shape would allow energy to be captured in the thickest portion of the quartz substrate, near its center. As a result, there would be minimal effects transmitted from the outer edge of the substrate, which in turn would help to suppress any unnecessary oscillation mode that could be generated. This shape would allow extremely high performance crystal units to be achieved, thus eliminating the conventional requirement to use a thermostatic oven. However, it was difficult to manufacture these crystal units because the central axis of both the upper and lower curved surfaces needed to be aligned with absolute precision. The units would not perform well unless this alignment was perfect. They decided to obtain the help of a specialist lens manufacturer. Although these enlisted professionals were indeed familiar with manufacturing glass substrates, it was their first time to work with quartz, so the initial collaborative process was a frustrating series of repeated failures. It seemed to be a near-impossible feat to ensure the upper and lower surfaces would align perfectly, but as they gained experience in this manufacturing task, their degree of proficiency also increased. As a result, they were finally able to achieve a quartz substrate with satisfactorily advanced properties. After their initial struggle to manufacture the quartz substrates, development proceeded smoothly overall. They were able to complete their development of crystal units, commencing with 550kHz and extending all the way up to around 900kHz, without any major obstacles. Their next goal was to attempt a 1MHz crystal unit. It was at around this time that Mr. Okano began to feel that soon they might be able to incorporate a plano-convex shape. A ‘plano-convex’ quartz substrate would be flat on one side and a convex lens-shape on the other. There would no longer be a need to align the central axes of both surfaces, and this would make the manufacturing process much simpler. However, a major hurdle still remained. The diameter of the quartz substrate would become much larger if only one side required processing. The biconvex substrate was more compact because both sides were processed. Still, it would be possible to make the diameter of the substrate smaller if they increased the frequency. Mr. Okano therefore set out to discover just how high the frequency would need to be in order to be able to switch to a plano-convex substrate and still achieve a diameter that was small enough to be practical. At that time, the frequency at which the biconvex shape could be switched to plano-convex was still not theoretically clear, so this was to be the world's first attempt at finding out. With his stance of ‘nothing ventured, nothing gained,’ Mr. Okano began his mission to thoroughly investigate the oscillation mode*5) of plano-convex quartz substrates. He discovered that theoretically, the threshold between biconvex and plano-convex was 1MHz. Manufacturing was going to be much easier if they could adopt the plano-convex shape. Furthermore, they would be able to achieve the same level of performance as biconvex substrates. Once completed, the AT-cut crystal units with vacuum-sealed glass tubes were delivered to the broadcast network. These new substrates were mechanically stable and achieved a stable frequency output without the need for thermostatic ovens. They were extremely well received and their customer was suitably impressed. As a result, they succeeded in taking the business of AT-cut crystal units for a number of broadcast networks away from their competitors. *5) The investigation of oscillation mode was conducted under the guidance of Professor Hitohiro Fukuyo of Tokyo Institute of Technology, author of the paper titled "Tanshin-hou ni Motozuku Suishou Shindoushi-no Shindou Shitai-ni kansuru Kenkyuu (translation: ‘Research on the oscillation mode of crystal units based on the probe method’)." There was certainly no time for them to rest on their laurels. Mr. Okano was next approached by a Japanese measuring instrument manufacturer. 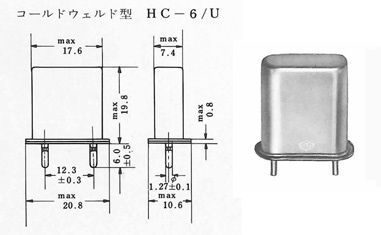 It was 1965, and the manufacturer wanted Mr. Okano to develop a compact quartz oscillator with extremely high frequency reliability for frequency counter devices. In those days, demand was expanding for both wired and wireless communication equipment. Accordingly, the performance of this equipment was advancing, and a need had arisen for frequency counter devices with extremely high precision. Although quartz oscillators that met the requirements of the measuring instrument manufacturer existed in the U.S., there were unfortunately none in Japan at that time. Seeing an opportunity to shine on the global stage, Mr. Okano decided to accept the challenge put to him by the domestic measuring instrument manufacturer, and resolved to create great oscillators for the Japanese market also. However, this was to be the beginning of a long and difficult road, as the instrumentation manufacturer demanded frequency stability at a level of 1 part per billion (1 ppb, or 10−9). It would be impossible to reach this goal using quartz alone as the material, regardless of how high its frequency stability might be. The only way they would be able to come close to this goal would be to adopt the use of the thermostatic oven once again. They already knew that they could achieve compact quartz oscillators with extremely high frequency stability if the crystal units were placed in the oven and the surrounding temperature was maintained at a controlled, constant value. However, they had never previously used ovens as part of the manufacturing process at Toyo Communication Equipment Company, so they would need to build their technical knowledge on this topic from scratch. The use of ovens would also introduce a new problem: it would be difficult to produce an oscillator that was compact enough to meet the stringent specifications demanded by the measuring instrument manufacturer. Mr. Okano felt that he was facing an almost insurmountable hurdle. It was going to be tough, but the only way forward was to keep putting one foot in front of the other. They began by developing the crystal unit they would be using first. Their objective was to produce a unit that could be housed in an HC-6/U package (Figure 4). To fit, the quartz substrate would need to have a diameter of approximately 15mm or less. However, the diameter of the previously mentioned crystal units that had been manufactured for broadcast networks was 25mm. This issue of size was another problem that would need to be resolved. Mr. Okano decided he needed to try a new approach. With the objective of creating a compact, stable oscillator of 1MHz, he decided to begin by increasing the frequency of the crystal units. If he could make the frequency higher, it should follow that he would be able to make the diameter proportionately smaller. He manufactured a 1.33MHz crystal unit and produced a 4MHz signal equivalent to three times the wavelength (third overtone). He then used a flip-flop (F/F) circuit to divide the frequency to 1/4, thus achieving a 1MHz frequency. Flip-flop circuits could be produced comparatively easily by using transistors, which had only just begun to be implemented for practical purposes at that time. It goes without saying that a plano-convex shape was adopted for the quartz substrate. 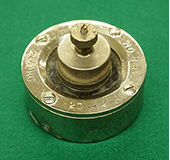 External dimensions: 20mm x 19mm x 9mm. Houses a round-shaped quartz substrate inside. These efforts enabled them at last to achieve a quartz substrate with a 14mm diameter, which could fit inside the HC-6/U package. The final issue to be resolved was the thermostatic oven, which they still were unsure of how to develop. They had to check and make decisions about a variety of aspects, such as the shape of the oven, the materials to be used, and where the thermistor should be positioned. Their patience was frequently tested, but Mr. Okano's development team never considered giving up. They worked every day until late at night, until finally their thermostatic oven was complete. Cold welding technology was used to create a vacuum inside the HC-6/U package containing the crystal unit and seal it. The package was then placed inside a hollowed-out aluminum block, after which heater wire was wound around its circumference. Next, the block was wrapped in glass wool and then placed inside the case, thus achieving frequency stability to the parts per billion (ppb) level. Both the reproducibility and temporal change characteristics were excellent. The measuring instrument manufacturer prepared detailed values of standards for reproducibility in terms of whether any changes were observed in the frequency after one hour, one day, and ten days had elapsed. The quartz oscillator they had developed successfully passed the tests for each of these values (Figure 5), and the engineers from the instrumentation manufacturer were completely amazed. These oven-controlled crystal oscillators (OCXOs) were launched on the market in 1968, after which it was their competitors' turn to be completely amazed. It's not surprising that these rival corporations immediately began their own new developments in a frantic effort to catch up and get ahead, but they were unable to achieve the same levels of frequency stability, reproducibility, or temporal change characteristics. Mr. Okano heard tales of many companies that had abandoned their developments. He believed that the key to success had been his decision to adopt the plano-convex shape, which he had studied so intensively, as the shape to use for their crystal units. Regardless of how well they might be able to control the thermostatic oven, his concept could never have worked unless the crystal unit itself, as the oscillation source, was excellent. As he reflects on those days, Mr. Okano says that the difficulties they encountered in developing the AT-cut crystal unit were well worth it in the end. He believes that the difference between the success of Toyo Communication Equipment Company and its rival corporations lay in the solid foundation afforded by the skills he had gained in the various developments up until that stage. After an oven-controlled crystal oscillator (OCXO) is switched on, only extremely small frequency changes are allowed. 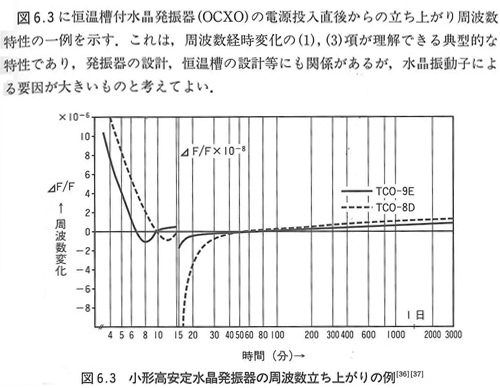 Source: ‘Crystal Frequency Control Devices (Suisho Shuuhasuu Seigyo Debaisu in Japanese),’ authored by Mr. Okano (published by Techno in 1995). AT-cut crystal units and oven-controlled crystal oscillators (OCXOs) became two of Mr. Okano's greatest triumphs. While the average person may think that such humble innovations seem inconsequential, it would be no exaggeration to say that these established the cornerstone of quartz device technology today, and were of major importance. Through the experience and knowledge he acquired developing crystal units and other devices that incorporated convex technologies such as biconvex and plano-convex, Mr. Okano succeeded in establishing the concept of ‘oscillation regions in crystal units.’ This concept has become the cornerstone for current technologies, and has been applied to a variety of different crystal devices. Specifically, such technologies include ‘trap mode,’ which traps oscillation from the mass effect of metal electrodes installed on the quartz substrate; ‘mesa structure,’ which encapsulates oscillation in the thick, central section of a quartz substrate that has been shaved around its outer surface using photolithography technology; and ‘inverted mesa structure,’ which achieves higher frequencies by thinning out only the central portion of a quartz substrate. Furthermore, the concept of ‘oscillation regions in crystal units’ led to improved techniques to make crystal devices even more compact, as well as increasing awareness of the importance of the degree of flatness and parallel flatness at the time of manufacture. In other words, this concept became the foundation that led to the birth of ‘QMEMS’ technology following the integration of Toyo Communication Equipment Company and Seiko Epson Corporation. Born in Kawasaki City, Kanagawa Prefecture, in 1931. Graduated from the Department of Electric Wave Engineering, University of Electro-Communications, in 1954 and joined Toyo Communication Equipment Company the same year. Worked with crystal units, quartz oscillators, and oven-controlled crystal oscillators (OCXOs). Also engaged in other devices such as temperature controlled crystal oscillators (TCXOs) and clock oscillators. After retiring at age 60, Mr. Okano was appointed the Executive Director of the National Crystal Oscillator Industrial Guild (now known as the Quartz Crystal Industry Association of Japan). He currently works at Okano Gijutsushi Jimusho (‘Okano Engineering Consulting’ in English), where he provides technical support and advice to quartz manufacturers. During his working years, Mr. Okano's hobby was ballroom dancing, and he notes that this skill helped him make personal connections when attending parties at international conferences held in Europe or the U.S. He is the author of ‘Crystal Frequency Control Devices (Suisho Shuuhasuu Seigyo Debaisu in Japanese)’ (published by Techno in 1995). QMEMS is a registered trademark of Seiko Epson Corporation.